I did notice that the "*" hack (i.e. "*color: blue") also seems to get picked up by IE8, while he lists the hack as for being for IE7 and below. Paul even set up a test page with all the hacks for testing. I recently upgraded to Eclipse 3.4.2 (Ganymede) and started having problems connecting to Trac. I didn't have any problems with Mylyn v2.3.2 in Eclipse v3.3, so I knew there were no configuration issues my installation. The first thing I did was bust out an HTTP proxy tool so I could view the HTTP traffic being sent. Turns out that Mylyn was not sending the authentication header, so my servers was just spitting back a 401 authentication failed message. I did a lot of searching and finally found the authentification fails with mod_auth_sspi or NTLM issue in the Mylyn bug tracker—which appears to be the exact issue I'm having, but alas upgrading to even the weekly (Mylyn v3.2) did not fix the problem. Finally, I decided to just uninstall all the versions of Mylyn I had installed, but v3.0.5 that came with my Ganymede installation. To do that, you've first got to disable all the plug-ins and then you can uninstall. Fortunately, rolling back to v3.0.5 has gotten me up and running again. Our Trac server is running Apache 2.4 with Trac 0.10.4. We also are using SSL with a custom cert and using Windows Authentication. Yesterday I ran into a very weird issue that one of our users reported. They complained that a Flex component was not working. Originally they described the problem as the Flash wasn't loading at all, but after digging around (and having the user send a screenshot) I realized the Flash was running, but it just wasn't getting the data. Sure enough, I fired up Internet Explorer 7 and I saw the exact same issue. This was working fine in other browsers (such as Firefox, Safari and Chrome.) I was also having no issues using SSL on our development server. All I can think was "WTF?" So, off to Google I went looking for an answer. After some digging, I finally came across Mark Speck's IE7 + SSL + XML? = Flex "Error #2032: Stream Error" post. While I had found a number of similar posts declaring the same problem, every other article I found indicated this was only a problem if the "Cache-Control" header was being sent—which my production server was not sending. However, Mark also documented that this issue could occur with no "Cache-Control" heading—which matched what my production server was doing. Thankfully this resolved the issue. However, I was never able to figure out why I was not having the problem in our development environment. The headers were virtually the same between the two servers. I'm beginning to think this problem might have also been related to the static XML being served via GZIP over SSL, but my dynamically served file is still being GZIP and is using SSL—so I'm not positive GZIP played a part. I did find one other solution and that was to serve the static XML over HTTP instead of HTTPS. However, we're forcing traffic over SSL, so that option would work for us. I thought this would hit the blogsphere a little harder, but Vince Bonfanti was able to get a heavily modified version of Open BlueDragon running on Google Apps. The announcement is a bit buried in a Google Group list for Open Blue Dragon, but the announcement is pretty exciting, because it opens up a new alternative for hosting a ColdFusion application and it's free for pageviews less than 5 million a month. "raw" CFML page just as you normally would. number of other restrictions when accessing the Java class libraries. the GAE environment due to the Java class library restrictions. does not support SQL datasources). As you can see, there's a lot of modifications that were required and some that may even be deal killers depending on your requirements, but there's still plenty of opportunities to build something exciting. This would be an excellent way to put an idea to production without investing anything but your time. I ran across a cool site today called Sorting Algorithm Animations. The site covers 8 popular sorting algorithms and gives you animated illustrations so you can see how each sorting algorithm works. You can even run the animations for all sorting methods at the same time to see how each compare in performance to one another. What's really interesting is that it shows there is no "best" sorting algorithm. While "bubble" sorting works great when the data is nearly sorted, it's horribly slow when the data is ordered in reverse order. Other methods tend to perform about the same regardless of the randomness of it's data. The other nice thing is that it details the algorithm used for each sort technique. This is a great resource if you need to roll out your own sorting algorithms and are trying to decide which algorithm makes the most sense for you application. I ran across the ScreenCastle service the other day and wanted to blog about it. ScreenCastle offers a free Java-based screencast recording solution. What separates it from other solutions is there's no installation required—other than accepting the Java cert when the applet loads. It's definitely not as feature rich as Camtasia or Jing, but it will serve the most basic purposes for recording. Where it really shines is as a tool for debugging a customer's problem. They don't need any other software installed, they just go to the ScreenCastle website and click on the big red button and record away. When their done recording, the video gets pushed to the ScreenCastle server and then provides the user with links, embed code, etc—which they can then e-mail to you. Anyway, this is a great tool if you want to be able to have a customer record what they're doing on the screen and send you a video of it. Mike Jones just publish an article on Reconnecting Flex Builder Plug-in To Eclipse—which shows how to move an installation of your Flex Builder Plug-in to a new installation of Eclipse without having to uninstall/install. His instructions are for Mac OSX, but it looks as if they might be virtually the same for windows. Below are Mike's original instructions. If all went to plan you can now close eclipse, delete the old version and rename the new one - job done. While I haven't tested this, it looks like this should work in Windows with the exception being the "link" file is actually named com.adobe.flexbuilder.feature.core.link in Windows. This is one of the funniest football stories I've heard in a long time. This comes from a great interview with Craig Wolfley—the color analyst for the Pittsburgh Steelers. BTSC: You were part of many great games in the Browns-Steelers rivalry. I make no attempt to hide my disdain for the Cleveland Browns. What one thing do you remember most about that rivalry? WOLFLEY: Tunch Ilkin used to get anxiety attacks where he would throw up alot. You never knew when they would happen. Even in training camp, he would throw up at any time. Anyhow, we're playing the Browns in a preseason game in the early 80s. Tunch is standing next to me in the huddle and I notice vomit on my foot. Tunch is gurgling. We broke for the line and I could hear his stomach. I'm thinking, this could be great. On that particular play, I was assigned to help Tunch double-team their defensive tackle, Ron Simmons. Right at the snap, as if it were choreographed, we both lunge at Simmons and Tunch lets it loose. I'm not talking about a dribbler, I'm talking about a gusher. He heaves right in Simmons' face and the guy goes crazy. We didn't need to block him. He was PO'd beyond belief, Tunch is sick and I'm laughing hysterically. The next play he still has chunks on his face and he lines up four yards behind the ball. Tunch didn't have to block him the rest of the game. I'm still laughing. 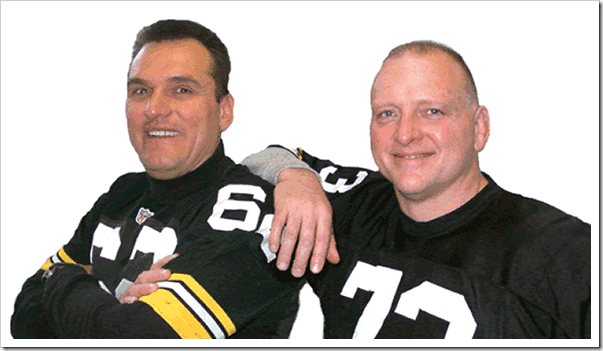 Thanks to Behind the Steel Curtain for such an entertaining story! One problem that can often come up when designing a web site is problems with legibility of the text on your web site. You might have issues with kerning, line spacing, font size and even the contrast between the foreground text and the background color. The tool I'm sharing with you today is one to help ensure that you have proper contrast between the foreground text and your background color. The color contrast tool uses the W3C has formulas developed by the W3C to detect sufficient contrast between your text and the background color. I originally got the idea from the Color Contrast Check tool, and while it's really helpful fine tuning settings, it didn't really help through out some suggestions of colors that are close to my original but that will improve the contrast/brightness differentials. That's what makes the Color Contrast Tester unique. If your contrast/brightness levels aren't sufficient it'll work on some variations that improve the differential. While the tool isn't perfect, I've found it extremely useful over the past 6 months since I developed it. Using it is simple, just plug in the hex values for the foreground and background colors and it'll give you your brightness and contrast differences and then suggest some variations that pass what the W3C suggests as being appropriate.